Both Baron and Carmen have OFA Hip Clearances (Baron Good & Carmen Excellent), both have OFA Elbow ratings (Carmen normal 0:0 & Baron *Grade 0:1), OFA Eye Exam will be current within 12 months of the breeding, OFA Normal Heart clearance by a Board Certified Cardiologist, normal thyroid function, not on any medications, no skin allergies, seizures or other auto-immune disorders. Paw Print Genetics; Carmen is ICT Clear, PRA-Prcd Clear, PRA-1 Clear, PRA-2 Clear, DM Clear. Optigen/Antegene: Baron is ICT Carrier, PRA-Prcd Clear, PRA-1 Clear. * Note: Baron had a CT scan for elbow dysplasia and it is noted VERY mild in one elbow, before 2 years of age he prelimmed clear / normal with OFA on elbows. Carmen has 5 other siblings rated Normal 0:0 elbows with OFA. We are thrilled to announce this planned breeding and thank Susan Roberts for the opportunity to breed Carmen to Baron. I have watched Baron since Susan posted his 1 year old video on FB and he sure caught our attention back then. He is a very accomplished, titled and talented boy, what an incredible journey they are having together! Our goal for this breeding is to produce intelligent versatile retrievers in performance venues, strong hunting companions that are structurally sound, athletic, biddable and wonderful family companions. Both Baron and Carmen have a lot to offer, they are very focussed, biddable, lots of drive to retieve, strong marking dogs, strong water dogs, strong work ethic, fun loving personalities and solid Golden temperaments. Paired together, these should be some fun puppies for experienced homes, we are very excited! The puppy pedigree has a low inbreeding coefficient and is a wonderful blend of field, performance and conformation Goldens. I love talking about Baron – a “once-in-a-life-time” boy who has taken me on an incredible journey in his seven years. From the start he has surpassed everyone’s expectations, becoming one of the most versatile Golden Retrievers in Canada. In addition to his Master Hunter title in the States, he has earned a Canadian Grand Master Hunter title and has received several Judge’s Awards of Merit and a Reserve Judge’s Award of Merit in Qualifying field trials in Canada. 2017 was particularly rewarding when we were one of only six teams that qualified in Canada’s week long National Master Hunt Test held in Balmoral, Manitoba. In September we were one of 12 teams out of an entry of 68 to qualify in the Golden Retriever Club of America’s Qualifying field trial held at their Specialty in Maryland. Baron is also a Canadian Master Obedience Trial Champion and our goal for 2018 is to complete his Grand Master Obedience Trial Championship. In addition to his field and obedience talent, he is a beautifully structured boy. Bred and co-owned by Shelly Blom of Sterre kennels, he is an owner-handled Canadian Show Champion. Baron has brains, attitude, biddability and loves to work. He is a joy as a companion with his wonderful sense of humour and remarkable on-off switch that is one of the hallmarks of the best retrievers. Every day is a joy with this boy. When not working or playing with his “harem” at home, one of his greatest treats is swimming and diving. It’s a sight to behold as he dives underwater for seconds at a time to retrieve small logs from the bottom of our little river. We now have a daughter of Baron’s who is so far proving that the apple does not fall far from the tree with her love of working, her lovely sweet nature and her ability to learn quickly and willingly. Carmen is a very fun to run, athletic, strong hunting retriever measuring just shy of 21" at the withers and weighing 60 pounds. 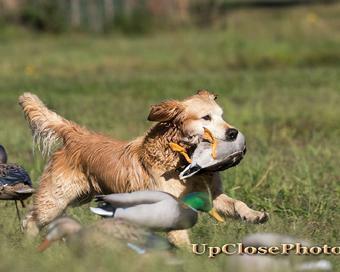 She lives to retrieve and her speed and marking is fun to watch. More information on Carmen can be found on her page on this website.